You know the saying: Oil is thicker than water. Well, that really stopped me from ever wanting to try an oil-based cleanser. Something about putting oil on my face when it already felt oily just didn't sit right with me. And yes, I know that dermatologists have been recommending this for years -- but sometimes I'm slow to try these newfangled ideas! Let me be the first to admit how wrong I was ... because the second I tried Bobbi Brown Cleansing Oil, my entire life changed. At first, I didn't think I liked this product. It really did feel oily, heavy and thick as I started massaging it into my face with a cotton pad. But within seconds, it sunk right in and left behind skin that was fresh, clean and glowing. And the dirt and residue that had been on my face? GONE. I've seriously never seen my skin cleaner. It's due to ingredients like olive and jojoba oils (which condition the skin) and ginger root extract (to soothe and calm the skin). Color me impressed! 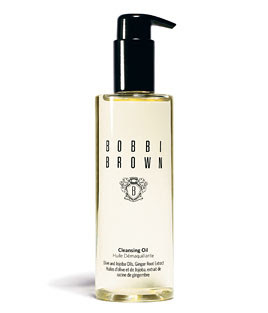 Bobbi Brown Cleansing Oil retails for $38. I have struggled with dry skin (I think I've posted about this) and never thought my face would be dry. But I have oily periods too so I always want a cleanser that is going to handle both easily. I've tried one oil based cleanser - can't remember the brand - and thought Hmmmm, maybe? Is this one stunning or just a hmmmm maybe kind of product? I really do love this cleanser. I stay away from most, but this one has been fantastic. I definitely recommend it!